John is TPM‘s Prime editor. His writing has also appeared at The Atlantic, Mother Jones, Salon, Slate, UN Dispatch, Vox, Worth, and Al Jazeera, and has been broadcast on Public Radio International. Before joining TPM, John was a producer for Bill Moyers and WNYC, and worked as a news writer for Grist. He grew up in New Jersey, studied history and film at Oberlin College, and got his master‘s degree in journalism from Columbia University. If President Donald Trump is hoping for a new, more aggressive legal strategy with a distinctly Trumpian flavor, he chose the right man for the job. The New York Times reports that diGenova “is not expected to take a lead role but will instead serve as a more aggressive player on the President’s legal team.” And when it comes to playing a role in D.C. investigations and media frenzies, this won’t be his first rodeo. Far from it. DiGenova and his wife and law partner, Victoria Toensing, were perhaps best known as frequent commentators during final year of Bill Clinton’s presidency, when the GOP was clamoring to begin impeachment proceedings. A Howard Kurtz column from February 1998 billed diGenova and Toensing as “the power couple at scandal’s vortex” and noted that “they’ve been quoted or on the tube more than 300 times in the month since the story broke.” That year, they were nearly omnipresent on cable news. But diGenova had been a D.C. operator for more than a decade already. In his role as a U.S. attorney, diGenova in 1984 put D.C. Mayor Marion Barry before a federal grand jury as part of a probe into allegations that Barry and other high-ranking city officials had bought cocaine. In 1987, diGenova led the prosecution against Jonathan Pollard, who pleaded guilty of spying for Israel and was released in 2015. In the 1990s, he was the independent counsel at the center of the Bill Clinton passport investigation, a criminal inquiry into whether officials in George H.W. Bush’s administration broke the law when they sought to dig up damaging information on Clinton through the State Department. DiGenova concluded that no one in the Bush administration acted illegally — though, he said, they had acted in a way that was “stupid, dumb and partisan.” In closing the investigation, he said that he was bringing “a Kafkaesque journey” to an end. DiGenova and Toensing have spent less time in the public eye since Clinton left office. In 2007, diGenova surfaced as the New York State Senate’s special counsel for its investigation into New York Governor Eliot Spitzer (D), who had ordered police to monitor the State Senate majority leader, Joseph Bruno (R). In 2009, diGenova and Toensing popped up as allies of Maricopa County Sheriff Joe Arpaio in his efforts to torment political enemies — efforts that resulted in an FBI probe. But to those political observers who were tuned to cable news during the later Clinton years, the power couple remains most remembered for their commentary during the Lewinsky scandal. In fact, a year earlier, before the Lewinsky scandal even got going, diGenova had an eye toward impeachment and argued against presidential immunity. In March 1997, he wrote in the Wall Street Journal that each day brough “fresh revelations of potentially criminal conduct by Bill Clinton, Al Gore and their aides, in matters ranging from Whitewater to Filegate.” A special counsel, he said, could offer the solution. “Independent counsels are not appointed by the White House, so presumably they should be free to pursue criminal charges against the president if his actions warrant it,” he wrote. It’s an opinion he might want to revisit in his work for Trump. Happy Monday. Here’s what we have our eyes on today. Good morning. Here’s what our team has its eyes on today. Good morning. Here’s what our reporters and editors have their eyes on today. Good morning. Here’s what our team is watching the morning after a squeaker of a special election. Was Rex Tillerson The Worst Secretary Of State In History? The analyses started long before his tenure ended: Rex Tillerson may well go down as the worst secretary of state in recent memory. “Tillerson was, as is now recognized even by those who put him there, a disaster,” political scientist and Bush administration adviser Eliot Cohen wrote in a December 2017 piece for the Atlantic, when President Donald Trump’s sword of Damocles was already dangling over Tillerson’s head. Now, Tillerson is out of a job, and the final verdicts are in. “Tillerson will undoubtedly rank among the least successful secretaries of state in U.S. history,” Hannah Gurman, a clinical associate professor of history at NYU, told TPM. Other historians of foreign policy that TPM reached out to concurred: Tillerson’s tenure was a low point in the post-World War II history of the State Department. Some historians, however, conceded that the former CEO of ExxonMobile faced a near-impossible task. “The fundamental problem seems to be his relationship with the President — but even there it’s not a failure to communicate but the President’s failing as a leader and manager,” emailed Paul Musgrave, an assistant professor of political science. While Tillerson’s tenure might be the pits, historians said that there are a number of runners-up for the title of worst secretary of state in recent history. “Tillerson’s tenure contains every lowlight of every recent unsuccessful term as secretary … but no highlight whatsoever,” Musgrave told TPM. President Ronald Reagan’s first secretary of state served a tenure that was nearly as short as Tillerson’s. He was sworn in on January 22, 1981; by July of 1982 he had resigned. His time in the administration was marked by strained relationships with other members of Reagan’s cabinet, but his resignation, which came during the early days of the 1982 war between Israel and Lebanon, took many by surprise. Rogers was secretary of state from 1969 through 1973. Like Tillerson, Rogers was largely ignored by his president, who more often sought the advice of Henry Kissinger, who was serving at the time as national security adviser. 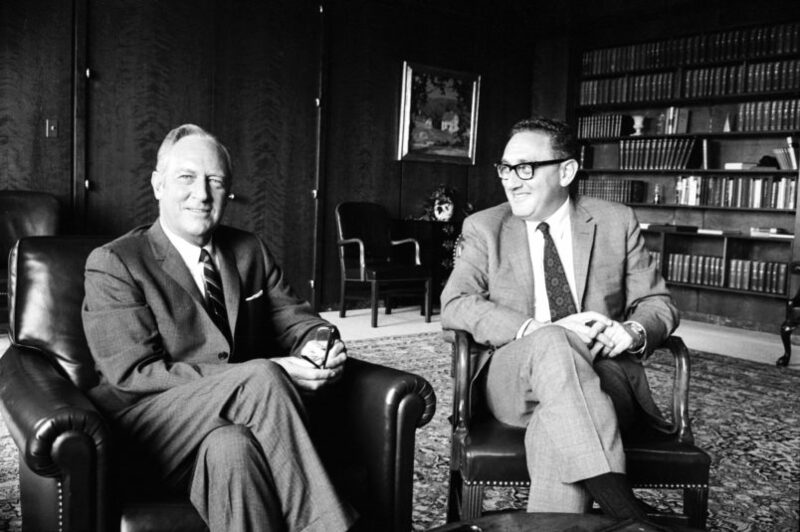 While Rogers was still figuring out U.S. policy toward China, for example, Kissinger secretly traveled to the country. His relative unimportance worked out all right for Rogers in the end — he left office untouched by the Watergate scandal. Tillerson’s unmatched ability to alienate his own department had a clear precedent in Henry Kissinger, Gurman told TPM. Morale at the State Department was low after years of war in southeast Asia, and Kissinger alienated career diplomats further by reducing their influence over policy. Unlike Tillerson, however, Kissinger had President Richard Nixon’s ear. “While Kissinger traded off good relations with his subordinates for influence in the White House, Tillerson wasn’t able to exert influence on Trump — when it came to important policy disagreements — most notably the Iran nuclear deal and North Korea,” Gurman said. It’s been a busy morning. Here’s what our writers and editors have their eyes on. Good morning. Here’s what our writers and editors have their eyes on today. Good morning, and happy Friday. Here’s what our reporters and editors are watching today. A partial and continually updated glossary of terms you’ll find in our editors’ blog. the Brittle Grip: The growing insecurity of the very wealthy, even as their power has risen dramatically in recent years. the Comey myth: The public perception of James Comey as an apolitical man of independence and integrity. The myth is based in reality, but didn’t come into being fortuitously or without careful tending over time. Comey is the main author of and is wholly bound up with the Comey Myth. the Clinton Test: A throwback to the Bush years. When reacting to an action by a politician you oppose — in this case, Bush — consider whether you would react the same way if the action was carried out by a politician you support — in this case, Bill Clinton. the Dead Ted Bounce: A brief period during the 2016 Republican primary during which Ted Cruz, despite his unlikeability, appeared to have more popular support than Trump because of his campaign’s superior ground game. dignity wraiths: Men and women of once-vaunted reputations who have been reduced to mere husks of their former selves through their association with Trump. dominance politics: A political attack meant to show an opponent’s lack of toughness or strength by showing that they are either unwilling or unable to defend themselves. A politics derived from the inherent appeal of power and the ability to dominate others. militant ignorance: Trump’s complete lack of self-awareness about his ignorance. Trump’s Razor: According to Trump’s Razor, “ascertain the stupidest possible scenario that can be reconciled with the available facts” and that answer is likely correct. the Trump Attack Haiku: Trump has developed a twitter-based, 140 character, insult haiku literary form: Single clause declarative sentence, single clause declarative sentence, primary adjective/term of derision. Not every one of his tweets follows the exact metrical progression. But most of them do, and those that don’t appear to be permutations or attempts at the model. the weaponization of military sacrifice: The way in which Trump and his supporters frame dissent of all sorts as an attack on people who have sustained injuries or lost their lives on the country’s behalf.